Good morning everybody. Challenge 17 is from The Pink Team and our remit is to produce a card "For The Boys". So that's two male cards in a row for me. 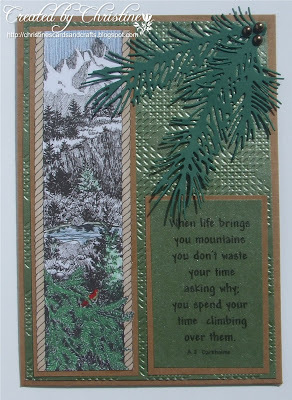 Our sponsor this month is Eureka Stamps and I have chosen Mountain Border for my card and you can find it here. We would love it if you would join us this time. The prize is three digi images of your choice. This quite a busy image and initially I was going to leave it black and white. My second thought was just to add colour to some parts of the image which I think works really well. My third thought was to try something I have been saying I will try but never ever getting round to it. I coloured it digitally using "Microsoft Picture It!" which is the software programme I use. I had a few false starts before I produced something I was happy with, but it was great because you just discard it and start again. I will certainly try it again at some stage. Green pearlescent card from stash. This card is for somebody special who is going through a difficult time - an encouragment card! I trawled the internet until I found this perfect sentiment. I hope you are all well. We had a couple of great summer days - and then back to the cold and wind and rain! What a start to summer! Well I must go . Take care. I think, you did a great job by this card. I just came back from the mountains and this makes me longing back for it! Brilliant card Christine, I just love what you have done with the image. Fantastic sentiment perfect for what you are using it for. Gorgeous card Christine love the design and colours a truly wonderful Christmas card. This gorgeous Christine. I love the way you have coloured the image and the sentiment is beautiful. Love the background texture - and the colors! You are the quotation queen as this one is very poignant. Coupled with the gorgeous image, I'm sure it will inspire the recipient no end. 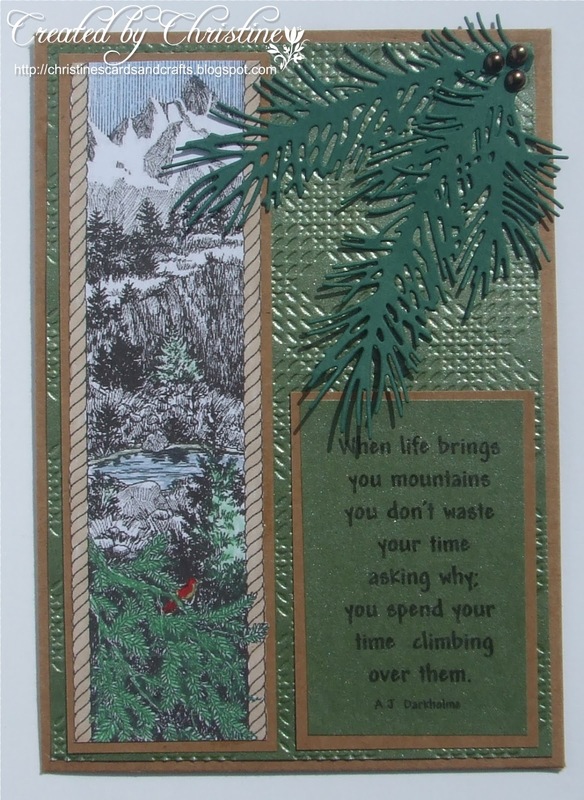 Great card - I can almost smell that pine and the mountain air. Fabulous! Thanks for joining in at Crafty Boots Challenges this time. What a natural scene, really nice. Beautiful card, lovely layout. Thank you for sharing your work with all of us at Crafty Boots Challenges.